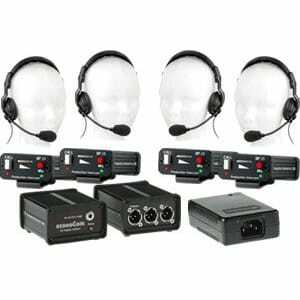 All EconoCom systems are product bundels of Pro Intercom's party-line intercom systems. Various EconoCom systems may include: an AC adapter with detachable IEC power cord, a PS4 system interface that connects to the adapter via cable. These two things are the power behind the system. 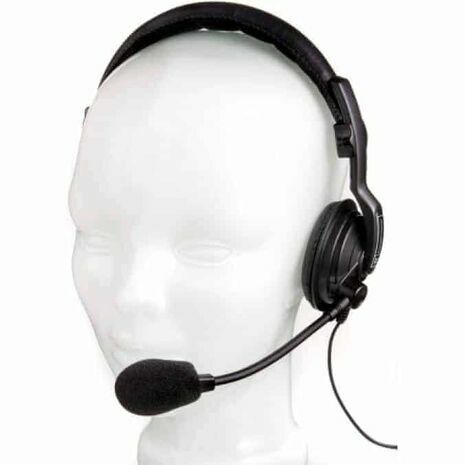 Two, three or four stock fully-loaded BP1 belt packs, and two, three or four of the extremely popular SMH310 headset, with a connector for each beltpack. 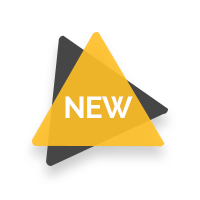 Products included vary between each EconoCom system. 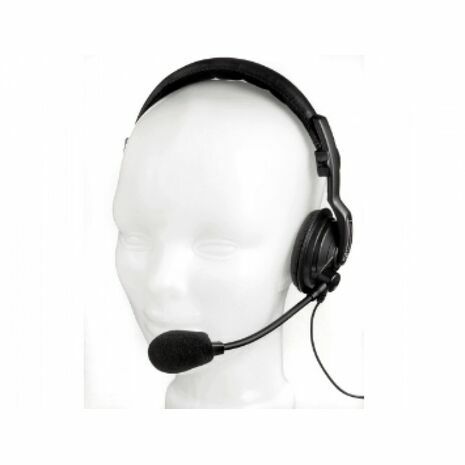 The systems are available without headsets as well. The systems do not come with a signal light feature. Anywhere from one to six additional BP1 belt packs may be added to the system (for a total of ten). 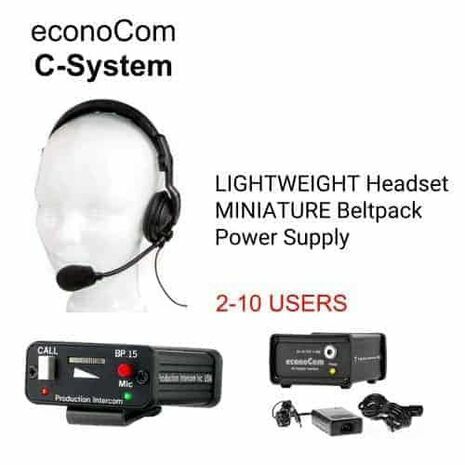 The econoCom AC adapter and PS4 system interface are completely compatible with Clear-Com® and other popular (200 Ohm, unbalanced) party-line headset intercom systems. 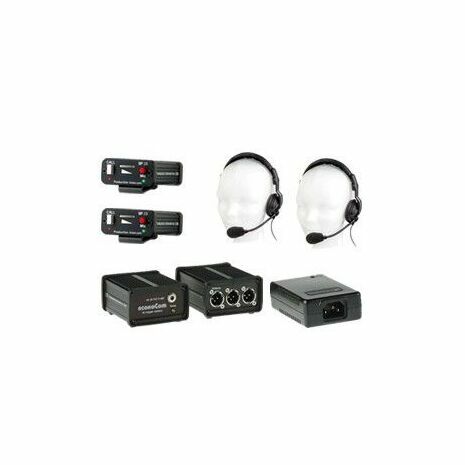 The econoCom system bundles include Pro Intecom's top-quality beltpacks, with complete signaliing abilities and may include headsets with connectors. The unique and specially-designed power supply includes a desk-top instead of a wall plug-in AC to DC adapter. This powers the PS4 Intercom. The PS4 regulates, limits and conditions the 24VDC need by the system and provides the necessary 200W termination point. The PS4 is contained in the exact same durable aluminum cabinet as the BP1 beltpacks. The PS4 has 3 parallel XLR outputs which provide three beginning points for the single common circuit. 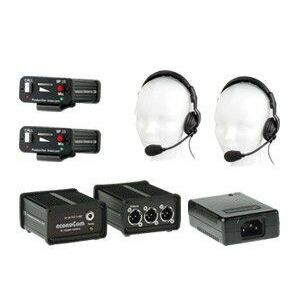 The overall system, aside from the AC/DC adapter and headsets is entirely made in Pro Intercom's Unites State's facility and includes their same warranty. The econoCom power supply, otherwise known as a PS4, is intended to be used in systems which require only one circuit. Up to 10 belt-packs may run on this system without creating hum or overheating the power supply. We recommend no more than two loudspeaker stations or stage manager stations however. Older belt-packs, particularly those with incandescent (rather than LED) signal lamps should be added with caution as they draw much more current. The AC adaptor (AD2410) provides up to 1.0A of current at a nominal 24VDC. It is UL® CE and CSA® approved. 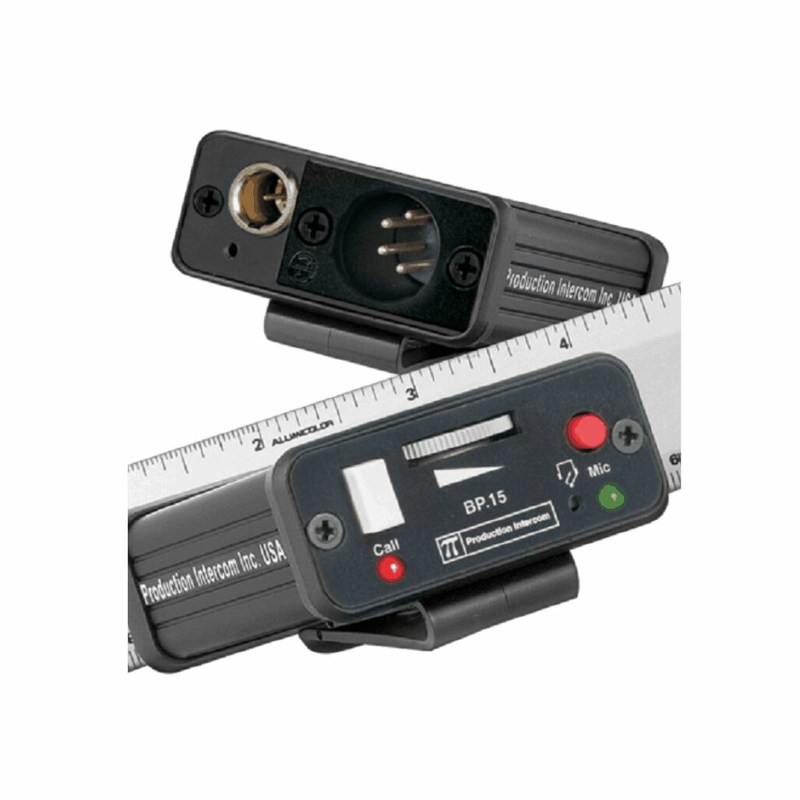 It has universal input, operating at any voltage from 100 to 240VAC at either 50 or 60 HZ. 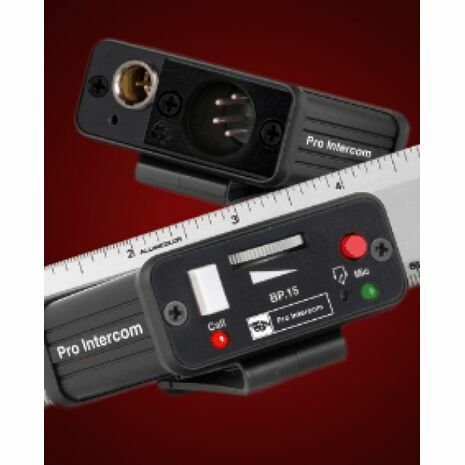 The PS4 system interface provides precise voltage regulation, further smoothing of the DC current (AC hum elimination), automatic overload/short-circuit protection, the necessary termination network for the intercom circuit, an LED which indicates that 24VDC is being delivered, and 3 paralleled XLR jacks for connection of headset stations or strings of stations in a party-line configuration. We have been asked many times for a lighter, smaller beltpack. Simply shrinking the BP1 was not an option because its size is actually determined by the space required for three XLRs on the back, and the size allowed us to insert second circuit boards to create products like the BP1SL and BP2. Our response is the BP.15 beltpack. We’ve retained the aluminum extrusion, impact resistant front and back bezels and recessed controls that are what makes the BP1 ‘bullet-proof’. To shrink the size, we sacrificed the headset and the loop-through XLRs on the back and used a smaller circuit connector. 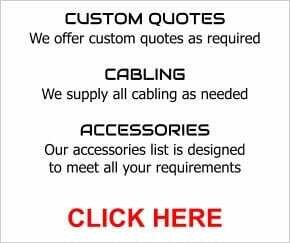 We offer an optional accessory cable to convert from the smaller connector back to XLR, and an optional Y-cable to allow looping onwards to the next station in the circuit. For a neater less cumbersome solution we suggest using the SB1 Splitter Box. The actual circuit of the BP15 is identical to the BP1, so it sounds the same. The size of the BP15 is approximately that of a deck of playing cards. All lightweight headsets are more fragile than their full-sized counterparts, but the SMH710 is definitely not disposable. It is repairable and the muff is replaceable. The audio quality permits wearing it for long periods without the ‘ear fatigue’ that occurs when the audio is of poor quality. And the other people on the system will similarly not be annoyed, as the microphone on the SMH710 sounds as good as that on the SMH310. At 3.88oz (110g) the SMH710 challenges all comers for weight, performance and price. 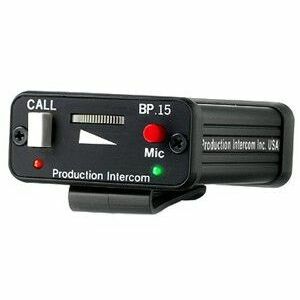 The SMH710 has a flexible boom which can be swung up into the vertical position and is fitted with a 4-pin female XLR connector and a foam ‘pop’ filter on the microphone. The SMH710 may only be worn on the left ear. The AC adaptor (AD2410) provides up to 1.0A of current at a nominal 24VDC. It is UL® CE and CSA® approved. 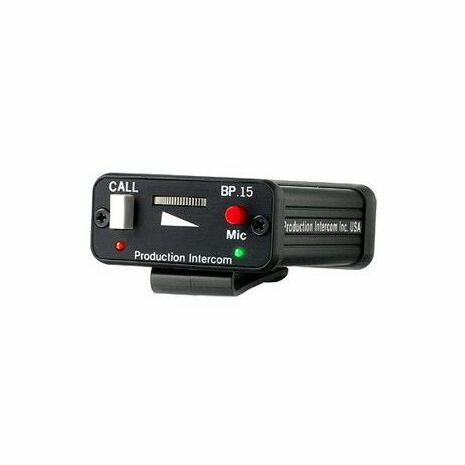 It has universal input, operating at any voltage from 100 to 240VAC at either 50 or 60 HZ. 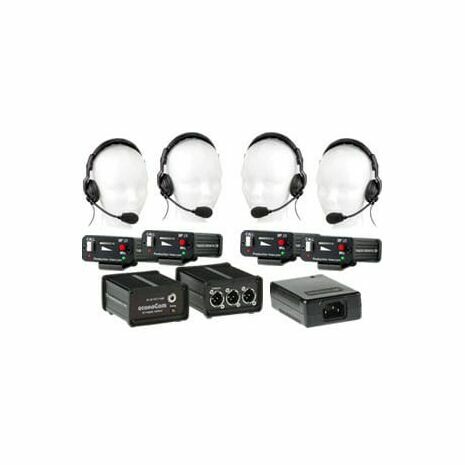 The PS4 system interface provides precise voltage regulation, further smoothing of the DC current (AC hum elimination), automatic overload/short-circuit protection, the necessary termination network for the intercom circuit, an LED which indicates that 24VDC is being delivered, and 3 paralleled XLR jacks for connection of headset stations or strings of stations in a party-line configuration. Power requirement: 18-30 VDC, 10mA quiescent, 30 mA max, with both lamps lit.